Completing online tasks to earn money is a very time-consuming business but it can be very profitable if you dedicate your self on them. There are people who earn more than $800 per month by completing online tasks. I searched all over the internet for today’s article to present you 22 best websites to join right now and start completing online tasks to earn money. If you are not familiar what online tasks are, then I suggest to read this article where I explain in detail what online tasks are. 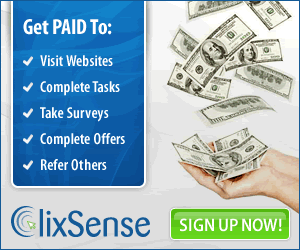 clixsense.com : One of the most popular PTC sites that pay its members on a daily basis for performing simple tasks. There are so many tasks and surveys available for you. getpaid.social : there are people looking for those who will help them do simple tasks. Jobs are always available for everybody on this website. Tasks like sharing a social media posts or liking them and so on are the simple types of work waiting for you. coinbucks.io : Complete different tasks and earn bitcoin. Tasks are available for every country in their world. Professional website with tasks such as Facebook likes, application downloads, visiting websites, clicking on ads and many more. mturk.com : with Mturk.com, you can choose the convenient time to work. You will have access to a global, on-demand, 24/7 jobs. You just need to look for jobs you think you can do, get it done and then get paid. You can withdraw your earnings via paypal. clickworker.com : This is a reputable website where you can make use of your skills to help other people who have one or the other assignment. You really don’t need to be a computer expert to work on here. easyshiftapp.com : Get paid to shop, eat and explore in your city. This is really easy; you are simply going to make money by having fun and enjoying yourself. All you need is either an iOS or Android App to get started. paid-surveys-at-home.com : Like the name sounds, it is a reputable survey site where you just have to take short surveys and earn money. swagbucks.com : Get free cards and cash for the everyday things you do online. Earn points that can be converted to shopping voucher or cash by shopping online, watching entertaining videos, searching the web, survey and so on. crowdflower.com : This is a reputable website that pays for completing simple tasks. You are ether helping them collect data or other things to make money. zoombucks.com : you can earn rewards online by collecting points through zoombucks and exchange for rewards in rewards store. It is a great earning means. goldtasks.com : Get paid for giving your opinion on products and services. Companies like Nike, Coca cola and so many other big companies are ready to pay you for giving your opinion about their product. shorttask.com : research jobs, data entry, article writing and designing jobs are here waiting for you. Do any of the jobs and earn good income online. airtasker.com : find people that need one or more services in their home and help them do it for cash reward. From you completing these jobs, you can get a lot of customers that you will be working for. offernation.com : Make money online with free paid survey and easy online tasks. rewardingways.com : one of the best GPT. They offer survey programs and you can earn 25% for referring other people. domystuff.com : Get paid to help other people get things done online. Find a task, bid on such task and get it done for money reward. microworkers.com : Microworkers is one of the best sites to do easy jobs for real money. The amount of money you make will depend on the numbers of task you are able to complete. get-paid.com : If you want to earn extra income, this is a good site to earn for little job. thesmartcrowd.lionbridge.com : A reputable work from home website where you can do simple works and get paid. clickchores.com : This is a site for micro workers. You can get enough work here that will put extra cash in your pocket. clicknwork.com : This website started way back since 2000 and people are earning day by day. You can join today and start working. I hope you enjoyed this list. I recommend to join each site one-by-one, ”play” a bit with them and stick with the ones you like the most.